Love or hate him, and there does not seem to be many people with an opinion in between, President Trump has completely changed the discussion on made in America vehicle production. As a candidate, citizen Trump made U.S. employment one of the cornerstones of his platform and message. He was derided by some, cheered by others, and many simply thought his idea to begin shifting manufacturing back to the high-wage, high-cost environment of the U.S. was simply out of touch with the new reality. As a President, Donald Trump continued his push, and it is fair to say that he has had a massive impact on the discussion, and perhaps the reality, of U.S. production moving back to the United States. And let’s be clear about one point; Mexico, and to a lesser degree Canada, are not part of Trump’s vision of where vehicles for sale in America should be made, NAFTA be damned. Early on, it was the Ford Motor Company that caught the attention and perhaps ire of Donald Trump. In particular, it was Mark Fields, a 28-year veteran of Ford who had recently taken over as CEO. Ford had made the determination that it was unprofitable to produce small cars in America. Prior to the election, while behind in the polls, candidate Trump slammed Ford over plans to move small car production to Mexico, calling it “a horrible move.” Candidate Trump said in a speech in Michigan on September 15th, 2016, "They'll make their cars, they'll employ thousands and thousands of people not from this country and they'll sell the cars right through our border. No tax, no nothing, and we'll have nothing but more unemployment in Flint and in Michigan." Ford's Mark Fields effectively called candidate Trump a liar on the subject that day, saying, "It's really unfortunate when politics get in the way of the facts.” In a CNN interview, Fields said when asked if Ford would cut any U.S. jobs as part of its plans to build a new plant in Mexico, he responded; "Absolutely not. Zero. Not one job will be lost. Most of our investment is here in the US. And that's the way it will continue to be." This set up a he-said, he-said between an unlikely candidate to win the presidency and the CEO of the company that manufactured the most automobiles in the U.S.
Once Donald Trump won the presidency, but before he was inaugurated, things began to shift. Mark Fields went to both CNN and Fox News to try to explain why Ford was canceling its $1.6 billion Mexican plant and instead, shifting $700 million and a significant amount of American jobs to, you guessed it, Michigan. CNN’s Poppy Harlow asked Fields if it was a coincidence that on the same day representatives from Ford met with the President-Elect Trump he threatened a “border tax” on automakers bringing cars from Mexico into the U.S. Fields was not keen to enter into another discussion that would put him at odds with Trump at this point, and instead pointed to the positive U.S. employment and investment news Ford had over the past years. Fields also pointed out that Ford’s new emphasis would be on green cars, both electric and hybrid. The discussion was again shifting. Automakers had begun to talk about U.S. employment. President Trump, Made In America, and Jobs Shifting To the U.S.A. Following the inauguration of President Trump, Ford announced in March of 2017 that it would invest another $1.2 billion to build the new Ford Ranger and Bronco SUV in Michigan. Now Ford was planning to build not just its most energy efficient cars in the U.S., but also its least. In total, Ford moved about 830 jobs into Michigan after Trump called out the company for planning to shift work to Mexico. In May 2017, just a few months after locking horns with the country’s new president, Ford Announce Mark Fields would be “retiring” after 28 years with Ford. Except Fields wasn’t retiring. Fields, who had worked almost his entire career with Ford, left the auto industry to take a position as a senior adviser at TPG Capital, a global private equity firm. Donald Trump didn’t just pick on Ford. He called out General Motors for moving a small car to Mexico. He spoke to Fiat Chrysler Automobiles’ CEO about bringing more production to the U.S. In a move that industry experts either misunderstood, or that some didn’t have the pride to accept, he also invited top automakers and even America’s smallest automaker in terms of sales, to join advisory boards that would provide input on manufacturing. Elon Musk was among those invited. Musk, to the cheers of his loyal fans, later quit the group over topics only peripherally related to strengthening manufacturing in America, such as global climate change. Having settled into his role to some degree, many would have expected what they took mainly as campaign rhetoric from Donald Trump to stop as he turned his attention to other matters. That didn’t happen. As a President, Donald Trump maintained his focus on growing his county’s economy and pushing for automakers to build the cars they sell in America within its borders. Toyota and other Japanese automakers were the next to hear President Trump’s message on manufacturing in the United States. In November of 2016, President Trump addressed a group of Japanese automakers in person and in their own country. He asked them to build the cars they sell in America inside its borders. The automotive and mainstream media had a great time reporting what they thought they heard. It seemed to them, though not to the business leaders in the room, as if President Trump didn’t already know that Japanese companies had been building some U.S. market cars in the United States for generations. 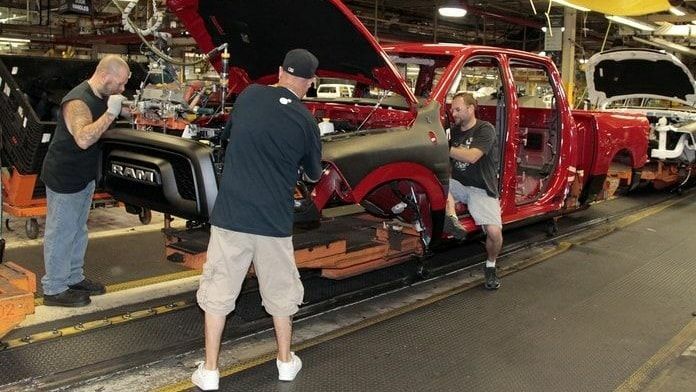 What the anti-Trump media don’t want to understand, because it isn’t easy to tweet, is that President Trump does not want some of the cars sold in America to be built here. Nor does President Trump want many or even most of the cars sold here to be built in America. He is pushing for all of them to be built here. He is setting a very high goal. That is how successful business people think. They aim high and if they miss the stretch goal, at least the full effort has been put forth. Shoot for the stars and you may well hit the moon. Japanese companies are heavily invested in North America, and like every automaker, regardless of what country they were first established in, they are finding out that Donald Trump cares not one whit what the North American Free Trade Agreement says. Mexico and Canada are not the United States. Toyota and other companies have plants and even plant expansions in Mexico and they won’t close overnight. However, what is changing is where the new plants will go and what markets the plants located in our North American neighbor countries will serve. Every Automaker Now Wants "Made In America Headlines"
Toyota and Mazda’s executives were in attendance during President Trump’s speech in Japan. He congratulated them on choosing the United States for their massive new joint venture manufacturing location. The new plant’s exact site had not been decided upon at that time, but since has. Which leads us neatly back to the main point of this story, which is that the discussion has changed. Toyota and Mazda held a joint livestreamed event to proudly announce the new location for their plant which will build a small car for Toyota (remember Ford saying that could not be done profitably here in the U.S.?) and a compact crossover for Mazda. The new plant in Alabama will add 4,000 jobs and represents an expansion of the 36,000 manufacturing employees Toyota presently employs in the U.S. However, it is Mazda’s first plant in the U.S. Not every Japanese brand builds its cars in the U.S.
Each year, the North American International Auto Show (NIAS), called the Detroit Auto Show by everyone except the NIAS marketing team, holds the world’s most important auto show in mid-January. This year, the big news was trucks, and there is no more American vehicle than the pickup. GM, Ford and Ram all launched a new truck in the span of one holiday weekend (Martin Luther King Jr Day). Like all new product launches, particularly truck launches, there was a lot of talk about engines, frames, and all that jazz. But this year, the prepared live statements made by executives on lighted stages and the pre-printed press releases all had another important message that they wanted to be sure was conveyed. All three truck makers emphasized the manufacturing location of their new trucks. All three wanted everyone listening (including a former real estate mogul and reality TV star) to hear that these trucks were being made right here in the U-S of A. General Motors went first. GM’s three live hosts mentioned the Ft. Wayne Indiana plant so many times it was almost embarrassing. It actually was embarrassing when the Plant Manager was asked to stand up and take a bow. No mention was made of the fact that GM still builds Silverados outside of the U.S and imports them. Ram was next with its 1500 pickup introduction. Included in its press announcements was the news that the new Ram’s production would be moving out of Mexico and into Detroit. The Mexican plant would be repurposed building trucks for sale to international markets. Ford went last. The all-new Ranger midsize pickup is coming back to do battle in a huge and expanding market that Ford had abandoned only to see GM and Toyota selling trucks right off the transport trucks the market was so hot. (remember that “retired” CEO?) Ford made it very clear that the new Ranger truck would be built in the United States, saying in its top of page summary the truck would be produced at Ford’s Michigan Assembly Plant. We haven’t offered any opinion here on President Trump. Rather, we have walked through a timeline of events starting in the middle of 2016 and ending this month pointing out facts and providing supporting sources. Whether President Trump will be an effective president is somewhat subjective. What is not debatable is that since an unlikely candidate who had never before held office entered the race for President in 2015, until this year’s biggest auto show, there has been a big change in the discussion about making automobiles in the United States. if more things can be made in the USA. It’s hard to find a lousy pencil made in the USA. You can’t tell me the Chinese are the only ones capable of making pencils... just an example. The more middle-class jobs and lower taxes for us the better. No more sky-high taxes and barista jobs!